The exceptionally fine salt became a coveted commodity, and Hawaiians mined it to sell to sea captains and others. By the mid-19th century, the salt’s popularity as an ingredient for incense in China left the lake depleted. Hawaiian mythology connects the Pele myths with the naming of Āliamanu and its sister crater, Āliapa‘akai (Salt Lake). Pele, the goddess of volcanoes, sought a home on one island after another. After leaving Kaua‘i, Pele and her faithful sister, Hi‘iaka, settled in Āliapa‘akai by digging into the ground. According to one story in Fornander, the red dirt and salt they brought from Kauaʻi was deposited in their new home, giving the craters the names Kealiapa‘akai and Ke‘aliamanu . Oʻahu’s nearly 50-acre Salt Lake (Āliapaʻakai) is in a low crater a little over a mile inland between Pearl Harbor and Honolulu. Legend held that it was “fathomless,” a belief persisting until recent years despite soundings made by the US Exploring Expedition in 1840 that proved it was "no deeper than 18 inches." Originally, Salt Lake was an evaporation basin fed by seawater seepages at highest tides and producing large quantities of crustal salt for domestic use. Because the lake had no outlet, water loss was largely by evaporation, concentrating the salt. Analysis of its water in 1891 indicated hyper-saline water and an unusual ionic content with low sulphate, and dominant sodium, magnesium and chloride. At the turn of the century, the railways were built and Oʻahu Rail and Land Company (OR&L) sent its 1st train from Honolulu to ‘Aiea in 1889. In describing the Salt Lake region, Hitchcock (1900) notes a cut along the Oʻahu Railroad less than one-half mile west of Moanalua Station which from bottom to top consisted of: "the main coral reef; thin layer of tuff; coral reef or limestone; decomposed rock sustaining a soil covered by forest; eruption of tuff from Aliapakai [Salt Lake Crater]…"
At the time of the Great Māhele, Moanalua ahupua‘a was controlled by Lot Kapuāiwa (he later became King Kamehameha V.) After Lot’s death, Moanalua was passed on to Princess Ruth Keʻelikōlani and then to Bernice Pauahi Bishop. In 1902, Damon leased Āliamanu Crater to the Honolulu Plantation Company. The US Government started purchasing land in and around Āliamanu in 1914 and shared use of the crater with the Honolulu Plantation Company. Reliable transportation and viable soil soon brought sugar cane to the fishpond boundaries. Damon maintained much of Moanalua as pasture, with portions leased to rice, sugar and banana growers. A tunnel, dug through the southeast rim of the crater (1894-1895,) controlled water level and provided an outlet. This act and later construction of a larger drainage outlet, eventually removed the salt from Salt Lake. Thereafter, it was used as a commercial fishpond for mullet and milkfish. The Damon estate sold much of Moanalua to commercial and residential developers in 1956. In 1966, most of the lake was filled in; all that’s left is a pond on the golf course at the Honolulu Country Club. Today, the region is part of Honolulu’s primary urban center and is characterizes as a residential community with portions in mid- and high-density uses, surrounded by higher-intensity military, airport and industrial uses. 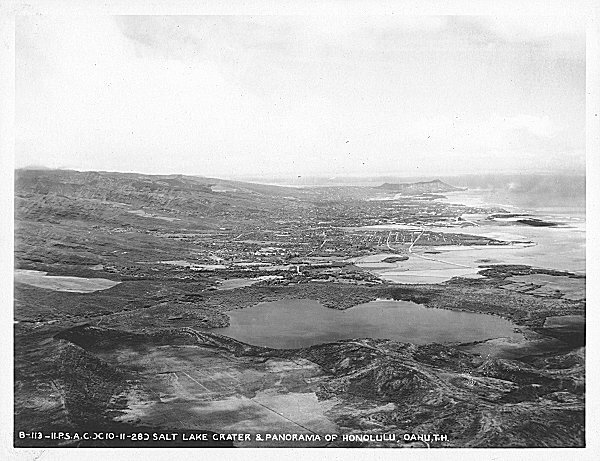 The image is a 1928 aerial overlooking Salt Lake toward Honolulu and Waikiki. In addition, I have added a few other images of the area in a folder of like name in the Photos section on my Facebook page.